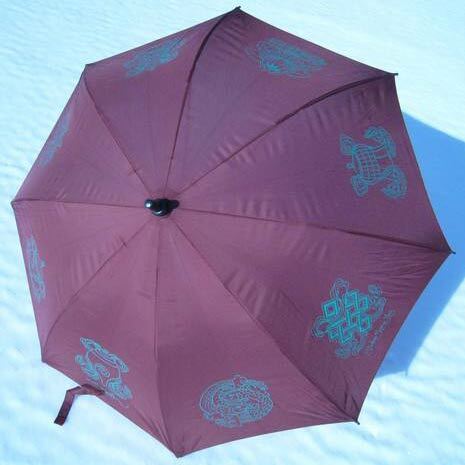 This one-of-a-kind umbrella is perfect shelter for the rain or shine, and makes unique Dharma gifts for friends and family. All proceeds support the Dharma activities of the Padmasambhava Buddhist Center. 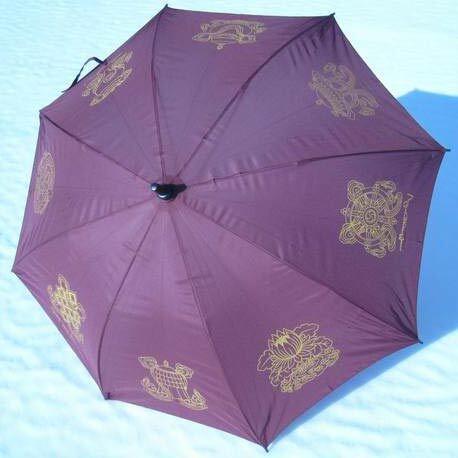 This umbrella has a burgundy background fabric with tourquoise auspicious symbols and calligraphy. NOTE: DUE TO HIGHER SHIPPING COSTS AND THE UNIQUE SHAPE OF PACKAGING MATERIALS REQUIRED TO SHIP THIS UMBRELLA PLEASE ORDER THIS ITEM SEPARATELY FROM OTHER CHISO ITEMS. SORRY FOR THIS INONVENIENCE.